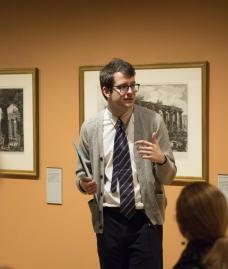 Jakub Koguciuk is a graduate student from History of Art and the Renaissance Studies Program. His dissertation entitled “Pastoral as genre and method” considers the relationship between the revival of classical pastoral tradition and the changes in Renaissance depictions of landscape in Northern Italy. Before his graduate studies, Jakub received his B.A. from the Courtauld Institute of Art. He has worked at the Victoria and Albert Museum and the Yale University Art Gallery.